Ever think about where your Spanish rice comes from? Home / Uncategorized / Ever think about where your Spanish rice comes from? 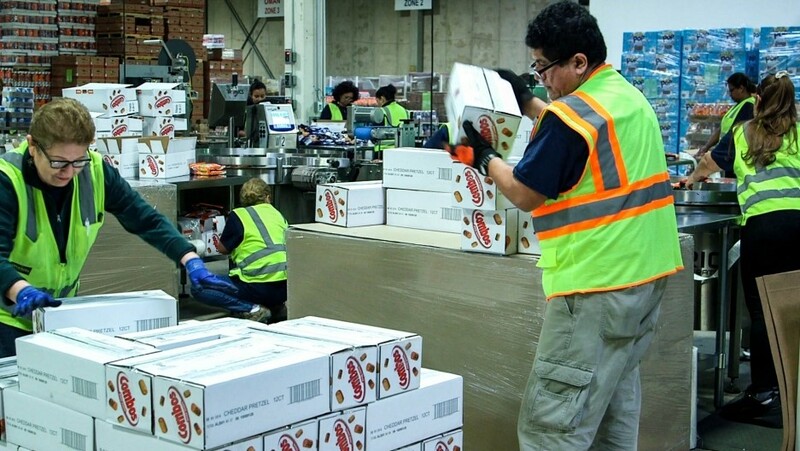 Workers at Y International in Lyndhurst, NJ, repackage boxes of American food products ahead of shipments bound for the Middle East. One of the latest food operations to set up shop in the state is Y International USA, a part of Abu Dhabi-based Lulu Group International. For the past year, workers at a large warehouse in Lyndhurst, in northern New Jersey, have been repackaging boxes and putting Arabic labels on American products bound for the Gulf countries: Saudi Arabia, Abu Dhabi, Dubai, Kuwait, Bahrain, Qatar and Oman. Why set up shop in New Jersey? Simple. Dairy products need to get overseas in a hurry. Goods coming from New Jersey are bound for the shelves in Lulu’s hypermarkets, a chain sprinkled throughout the Middle East and South Asia, which Weber describes as “Super Walmarts on steroids.” The stores sell everything from food to clothing to electronics. Increasingly, it also offers choices of American food and beverages, again, from New Jersey. Still, New Jersey, the food capital of America? Really? “Really, New Jersey!” says Brown, who rattles off the ways she believes her state is the ideal place to import and export food. Brown adds that companies can reach 22 million consumers within a two-hour drive. One of the bigger food companies in northern New Jersey is Goya, the largest Hispanic-owned food company in the US. The company just revamped a factory in New Jersey last year, which can now package 600 bags of rice a minute. And, if you’re a foreign food company looking to launch a product in in the US, New Jersey is trying to make another selling point: the nation’s only certified “soft landing” food incubator, the Rutgers Food Innovation Center (FIC) in the city of Bridgeton in southern New Jersey. The FIC will basically hold your hand to get your product launched, helping with everything from food safety regulations to marketing to finding out what an American consumer might like. FIC Executive Director Lou Cooperhouse says many of his international customers think the biggest challenge selling in the US will be regulatory. It’s not. Greek investor Takis Solomos has come to rely on Rutgers. He’s worked with the FIC on five projects, and is now working on bringing kebab meats to the US with the Greek company Megas Yeeros, the largest gyro producer in the Mediterranean. Even when they’re giving candid, but harsh advice. Solomos says they were ready to roll out a style of Greek sausage for American consumers, then Lou Cooperhouse and his team weighed in. Better to hear that before you go to market. The folks in New Jersey do want Greek sausages to be a winner though. Cooperhouse says successful foreign products translate into more food-related jobs in New Jersey. “The county that we’re in, Cumberland County, is actually the poorest county in terms of per capita income in the entire state. We’re also in one of the poorest cities of over 500 cities in New Jersey. But we’re really taking a very aggressive route at the globalization of the food economy,” says Cooperhouse. At the end of the day, Cooperhouse, and others in the state, think they’ve got enough to offer, so when foreign food companies think of coming to the US, they’ll think first of The Garden State.